When It Comes To Elections, Are We Shocked Lie-A-Watha Warren Wants This System For Picking Future Presidents? I mean are we truly shocked by Sen. Elizabeth Warren (D-MA) is for this when it comes to electing future presidents. She wants to get rid of the Electoral College and move toward a national popular vote only system. Ever since 2016, the Left has gone on a whine tour as epic as Hillary Clinton’s over their 2016 loss to Donald Trump. It’s not that they had a bad candidate, a shoddy agenda, or ignored half the country—it was because the Electoral College blocked them or something. It was either that, Trump cheated, or the Russians. It’s still a sad pathetic exercise. And no, it’s not about transparency or voting rights. Bashing the Electoral College is just another proxy way for liberal America to bash red states and its voters. You see it all the time. Why does Wyoming get an equal number of senators as California, a state that really matters? Yeah, and these are the people lecturing us about equal representation, voting rights, etc. it’s a joke. Give a liberal enough time, and he or she will hang themselves with their self-righteous, condescending, and utter unhinged progressive nonsense. In fact, their rants have shown why our Founding Fathers strayed away from having such institutions not be fully decided by a mob. And now, back to Warren. Warren, who is seeking the Democratic nomination for president, said during a CNN town hall in Mississippi that her view "is that every vote matters." "And the way we can make that happen is that we can have national voting and that means get rid of the Electoral College," she added. 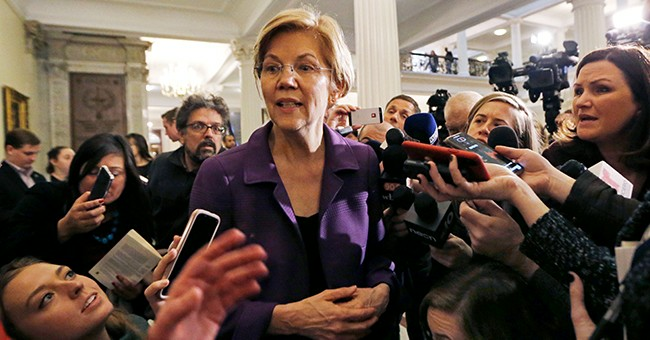 Warren added that she wanted to push the message in Mississippi because, during a general election, "candidates don't come to places like Mississippi" and other non-swing states. “They also don’t come to places like California and Massachusetts because we’re not the battleground states," she noted. "We need to make sure that every vote counts." Right now, there is a push for a national popular vote interstate compact. It has over a dozen states involved. Colorado is the most recent to join the chorus of states declaring that they will allocate their electors based on the national popular vote winner. It’s still just a policy debate topic, as there aren’t enough states that have signed on to get to 270. But once that happens, elections could change. I’m not for or against it right now. I’m all for having a debate on it, though I lean heavily towards keeping the current system. For Republicans, they looked into it because Florida was supposedly teetering on becoming a blue state. The state has broken for Republicans in 2016 and 2018, the latter year being the rage against Trump year for the Left. I think Trump will win it again in 2020 and Ohio is reportedly all but in the bag. Still, looking at the map. It’s a bruiser for both sides. And while I more or less favor the current system, because we’ve had the winner of a presidential race win the Electoral College but lose the popular vote five times in our past and the nation hasn’t exploded, I think the GOP could win in a popular vote-only system as well. There are millions of GOP voters in blue states that do not vote. The moderate suburbs will flee the Democrats’ hard left-wing agenda. I’m not afraid to have that debate. In such a system, both parties can run campaigns tailored to their base, not swing states. No moderating of the national message. So, the GOP can run on national security, lower taxes, smaller government, free markets, and personal liberty while the Left can run on the Green New Deal, political correctness, higher taxes, job-killing regulations, baby killing, favoring illegal aliens over American citizens, and gun confiscation. Again, keep the Electoral College is where I’m pretty much falling, but in the future, say we do change, I don’t think the GOP should panic immediately.